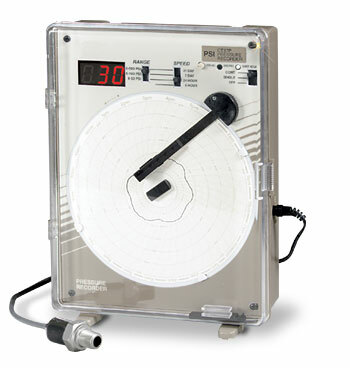 The CT87P pressure recorder is a versatile instrument that accurately measures and records pressures. The remote sensor has a 6' long cord and a 17-4 stainless steel pressure port with 1/4 NPT threads. Burst pressure 2500 psi rated for any gas or fluid compatible with 17-4 stainless steel. Battery backup assures normal operation during power interruptions. The unit can also be run from any 12 Vdc source (auto or marine). Nota: Each unit supplied with ac adaptor, charts, pens, batteries and complete operator’s manual.